Activity Management is where you can view and manage recurring donor information and transactions. It also acts as a manual gateway for adding recurring donations. To access it, go to Operations > Activity Management from your dashboard sidebar. This will automatically take you to a list of all of your currently Active Recurring donors. 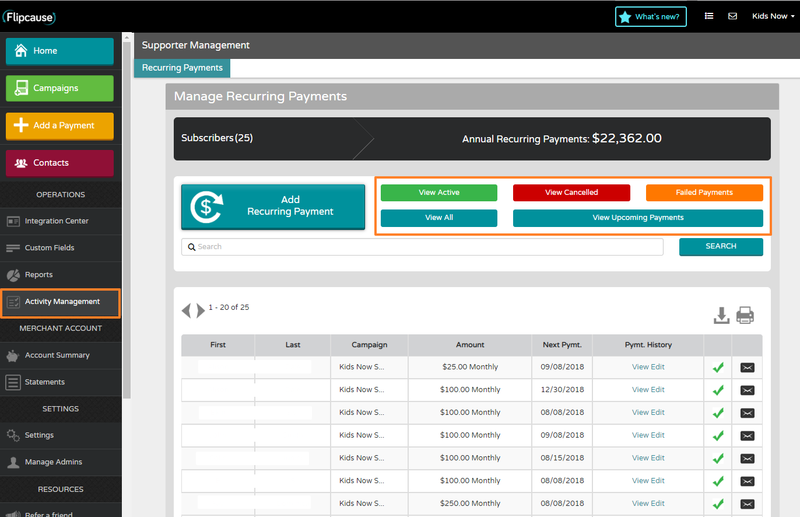 From Recurring Payments, you can fully manage your recurring payment activity, including viewing and downloading payment history, resending receipts, refunding transactions, and sending a message. You can also resend the donor confirmation link, edit payment information, and cancel recurring donations.